We’ve just published Nothing About Us Without Us, a retrospective report about the Cultural Heritage and Social Change Summit and it’s main themes one year later. 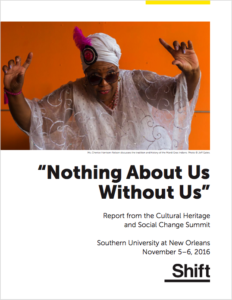 Special thanks to everyone who participated in the Summit, our co-organizers at Southern University at New Orleans MA in Museum Studies Program, the organizing committee and co-contributors in the report, especially Haitham Eid, Bergis Jules, Natasha Varner, and Archon Editing. Thanks Haitham Eid for sharing photos from the Summit on the SUNO Facebook page. If anyone else has other photosets to share, please let us know in the comments. Glam Space was not a term I had heard used before. kYm Keeton shared that this is the concept of “turning free space into art spaces”. Doing this with flare, making it attractive, will draw the community to the space. On college campuses it can become a great feat to accomplish glam spaces as politics present challenges. This session was a great think tank on how to navigate administrations for glam spaces. We also looked at progressing open space with Vera Warren-Williams by looking at the many possibilities open space presents in her book center. This discussion gave food for thought regarding all the different open spaces around us that can be used to bring art into various aspects of community. This document represents the initial outcomes of a conversation about the kinds of questions that digital project managers and planners should consider as they are beginning a project that includes data and materials that touch on human communities. It is only a beginning, and the members of the session eagerly encourage comments, questions, additions, and edits to the document. Please consider the draft and join our effort produce a set of questions of guidelines that will help to more explicitly address the ethical issues that are so frequently at play in our digital cultural heritage work. Get on the bus Gus!! Posted in UncategorizedLeave a Comment on Get on the bus Gus!! Day 2 had less sessions, which I think was a reflection of people being so torn by choice on Day 1, and also much more collaboration to join and co-facilitate sessions. Click on image to zoom. You can see the spreadsheet here: the “summary” sheet has analytic data like who’s been tweeting the most using the hashtag, the “dashboard” sheet has charts and graphs of tweeting activity, and the “archive” sheet is the straight spreadsheet of collected tweet data. You can also see a dynamic visualization of people using the hashtag to hold conversations. And here is a searchable, prettier interface for exploring the tweets. We had some excellent conversations yesterday about how new interfaces to existing data (like this archive and visualizations) may involve possibilities that people didn’t predict or consent to. Please do let me know if you have any reservations at all about our collecting and displaying tweet data this way (amandavisconti@gmail.com or @Literature_Geek). And if you’re interested in conversations around the ethics of social media archiving, interfacing, and research, at least two members of the amazing Documenting the Now project (Community Lead Bergis Jules, and Advisory Board Member Meredith Evans) are here, and the project nurtures a fantastic ongoing, open-to-the-public conversation around these issues on a Slack you can join (Slack is a set of thematically related chat rooms). These are very simple to set up to track any Twitter hashtag or other search—basically typing in your search term, and okaying some Google and Twitter permissions. (Note that because of Twitter limitations a new archive will only pull tweets a week back, but will catch all tweets going forward—so it’s good to create an archive as soon as you know you’ll want one). I’m happy to help if you run into any issues. thanks Effie for the photo! If you’re in town Friday and looking for some things to do, I highly recommend making your way out to the Bywater and checking out Studio Be to see the amazing work of Brandan “BMike” Odums, whose work is featured on our site (they are open Wed-Sat 2pm-8pm, $10 admission). And if you go a little further into the Bywater, you can check out our friends at the Music Box–an incredible music experience and it’s their opening weekend featuring the amazing Sunpie Barnes ($20 advance tickets). I’ll be at the 8:30pm show and hope you can join us! Of course there are plenty of ways to support local music and arts, including many of our partner and delegate organizations too! As you know, this is a grassroots effort, so we’re not doing fancy busses, but we’ll get you there. We can’t promise an Anthony Davis sighting, but we can promise we’ll be rolling in style in a New Orleans School Bus. If you’re staying at either of the MCN hotels, the AC Marriott is just around the corner away from the Quarter.